Jakarta, April 15:Dipping their fingers in halal ink to prevent double voting, Indonesians cast their ballots on Wednesday in a bitterly contested presidential election, with the main rival to incumbent Joko Widodo already threatening to challenge the result over voter-fraud claims. 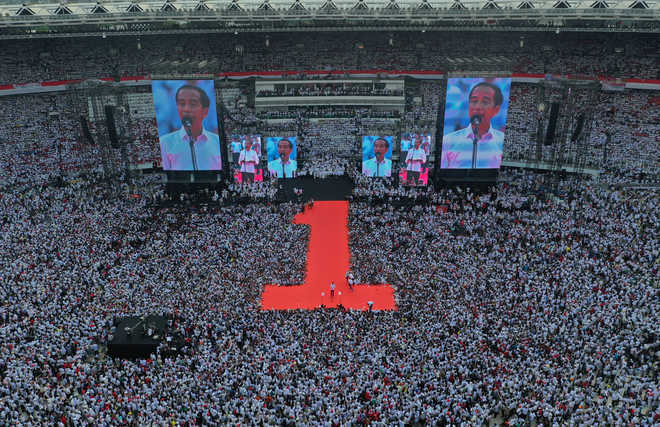 The Muslim-majority nation’s biggest-ever polls—with more than 190 million voters and 245,000 candidates vying for the presidency, parliament and local positions—is largely a referendum on Widodo’s infrastructure-driven bid to rev up Southeast Asia’s largest economy. Ballots will be cast at more than 8,00,000 polling booths across the volcano-dotted country, from the tip of jungle-clad Sumatra and heavily populated Java island to beach paradise Bali and far-flung Sumbawa. Voters will punch holes in ballots—to make clear their candidate choice—and then dip a finger in Muslim-approved halal ink, a measure to prevent double-voting in a graft-riddled country where ballot buying is rife. But victory for Widodo and Amin—known for his disparaging views towards minorities — could be the latest knock to Indonesia’s reputation for moderate Islam. “It’s inevitable that will affect policy making.” Subianto—joined by running mate Sandiaga Uno, a 49-year-old wealthy financier—has run on a fiery nationalist ticket. “This is a low probability scenario, but one with very high impact.” Many Indonesians just want a peaceful power transition—regardless of the winner.